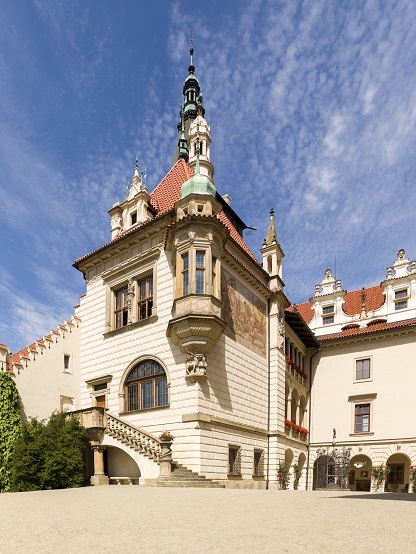 With a total area of 250 hectares, the Průhonice Park along with Průhonice castle are a Czech National Historic Landmark and a UNESCO World Heritage site. 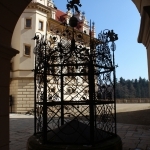 A lime tree alley leads you from Průhonice town square to the main gate decorated with an arc shield. Notice how the inside of the Renaissance gate alters in style to resemble a timbered country house with gables and balconies. The current appearance of the Castle dates to the late 19th century (see more history). The South Wing, also known as the Little Castle, was built on the structure of a former brewery which used to be connected to an adjacent church via a small conservatory, rebuilt into a dwelling in 1928. 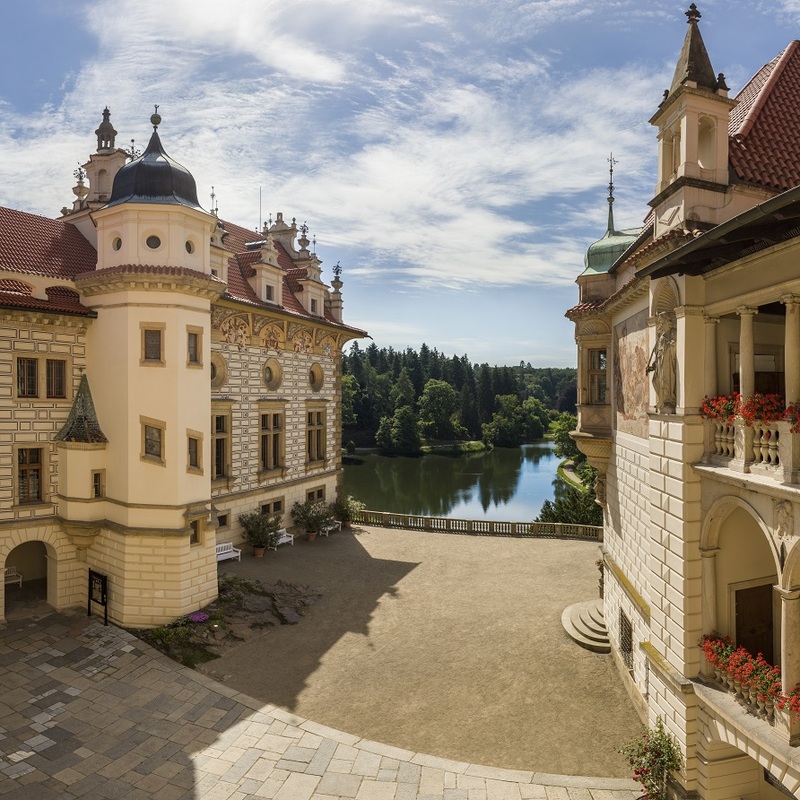 Its Northern front is modelled on Romanesque-style façades, while the Southern front opens onto a large terrace with a view of the lake underneath and with decorative gables loosely inspired by the Wallenstein Palace in Prague. 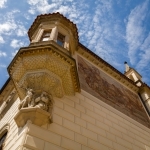 The rest of the Little Castle is in the Neorenaissance style, with richly decorated sgraffito façades. The North frontage is distinguished by a central spiral-like gable, bearing a clock and rounded off with a spire. 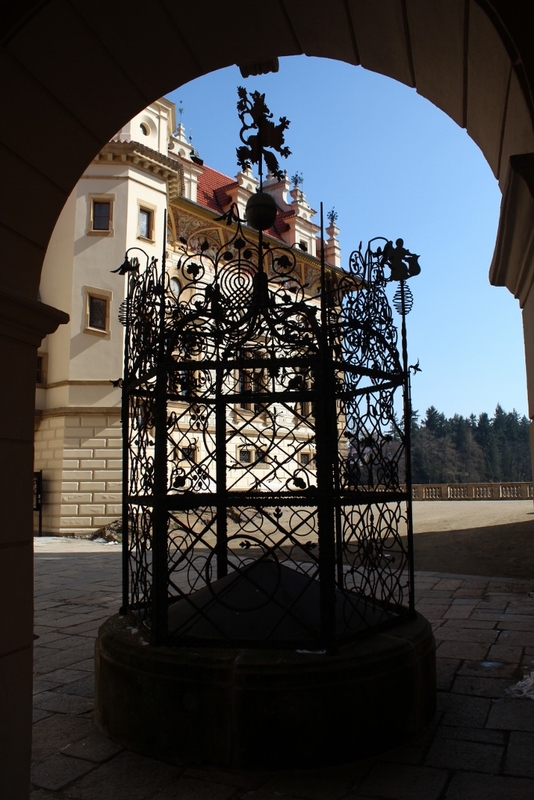 The Greater Castle, built on the structure of the old Průhonice fort, is horseshoe-shaped, since the architect Stibral had a part of the South Wing demolished to open the inner courtyard out over the lake, providing a grand view of the park. The rest was renovated and heightened, with the new addition of a grand Knights Hall including its ornate ceiling. The frontage of the Greater Castle has not been altered significantly. Its central part, originally ending in a simple triangular gable, received an elaborate superstructure with an image of the Assumption in the balcony, side spires and a lantern in the apex, but the lower structure was left in its original state. The courtyard gate is intricately decorated. Entering the Inner Courtyard, our attention is drawn first to a beautiful fresco of St George, next to the oriel, painted in 1892 by Hanuš Schwaigr – the largest fresco he completed. To the left is a statue of St Hubert by the sculptor Celda Klouček. Another of his statues is by the inner staircase of the Greater Castle. 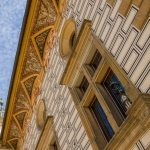 The opposite wall, with the large windows of the Knights Hall – modelled on the Old Royal Palace at the Prague Castle – has a lunette ledge with painted coats of arms, and a rustic sgraffito façade with gradual gables. 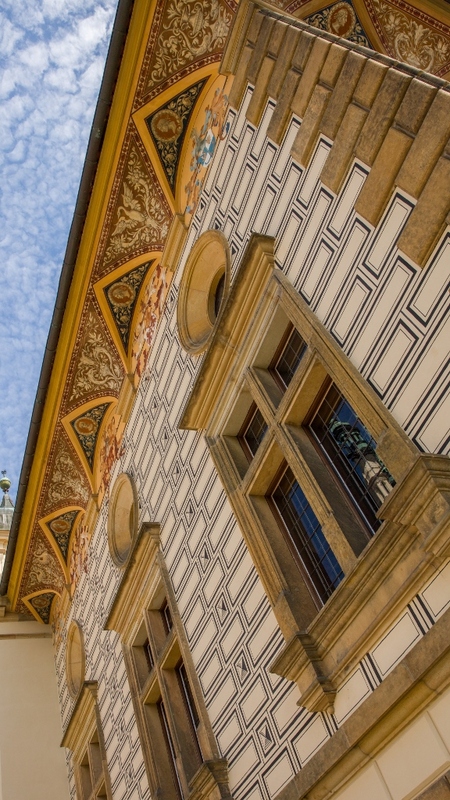 Underneath the oriel sits a fountain with ornate grating, a faithful copy of the fountain at Little Market Square in the Old Town of Prague. The architect joined the West Wing of the Castle with the old renovated bastion, which projects dramatically over a rock on the west front. The northwestern tower, decorated with wooden panneling, is new and may have been built on the site of a former castle rampart, which was nonetheless gone by the time of the previous renovation. The expansive cellars of the Castle, carved into the underlying rock, have been partly renovated; they are decorated with lesser frescos by Schwaigr. One shows a Renaissance-style feast, another a humorous tournament, the ceiling holds a Bacchus with signs and a Bacchus with Noe receiving a grapevine from the Lord; the last represents a Roccoco-style drinking feast. 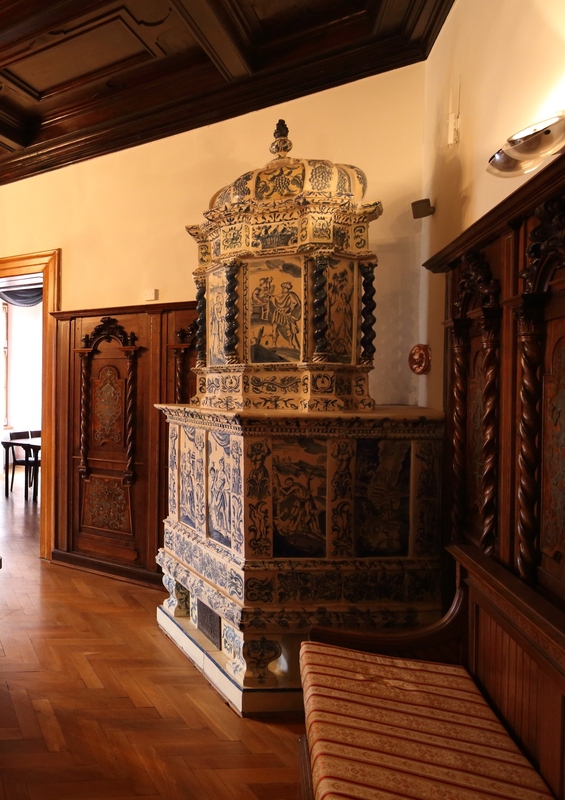 The interior of the Castle is mostly new following the recent renovation in 2010; only two large stoves remain. One is Baroque (in the Blue Room), made of richly sculpted glazed tiles, the other from the late 18th century, made of flat white tiles with figural decoration. During the last renovation a conference hall was added on the first floor of the Greater Castle, which serves for scientific meetings and seminars as well as for commercial use.